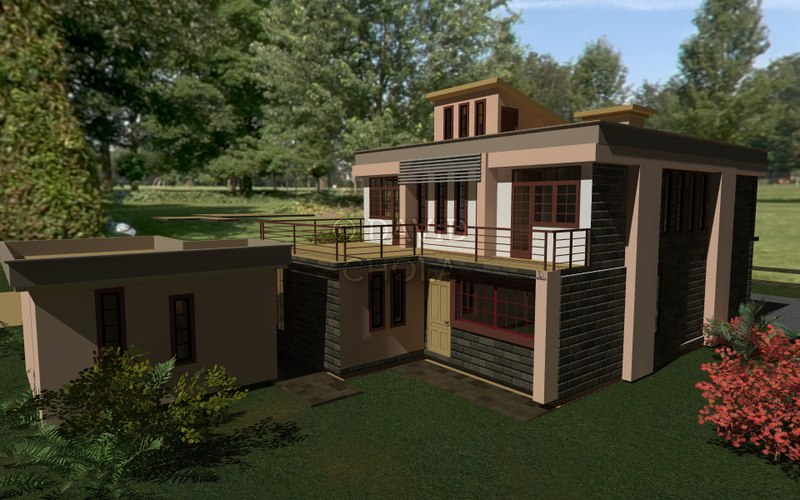 Because of these and many other reasons, we have designed this Contemporary House Plan to fit within a narrow piece of land. 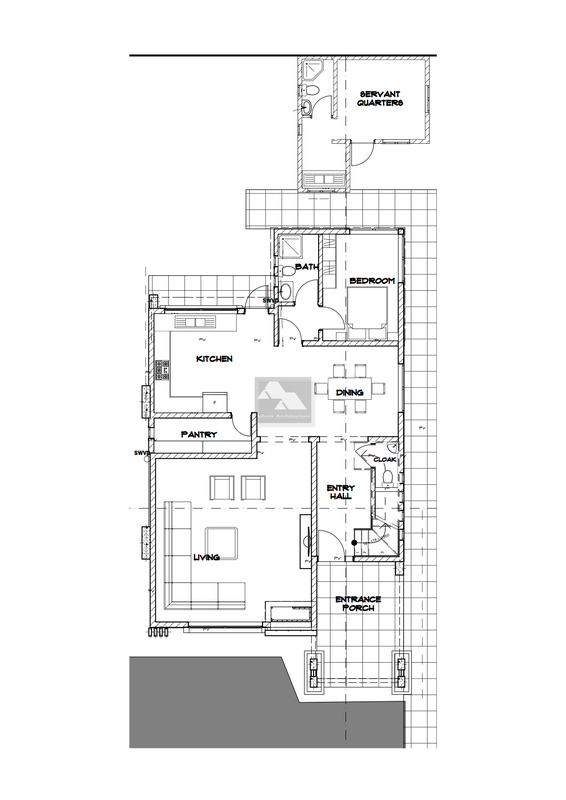 We have organized floor plans on both levels to ensure that all the necessary spaces are well provided for. A nice entrance porch leads up to the entrance hall, where you also have the shared cloak room, well positioned for guests. The plan has an extra spacious lounge complete with an inviting fire place. The large kitchen has an adjoining pantry, and a dining hall to one side. On ground floor, you have one en suite bedroom and behind the house, you have a self-contained servant’s quarters. Upstairs you have a nice cozy TV area. You also have two other en suite bedrooms that have direct access to a back balcony. The spacious master bedroom has a bathroom complete with a walk-in closet and access to a roof terrace to the front. The roof terrace can also be accessed from the TV area. 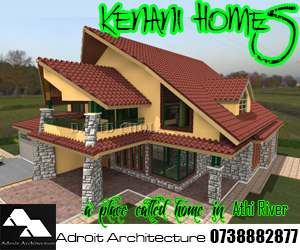 This house plan has a plinth dimension of 10.6M by 17.5M excluding the SQ or 10.5M by 24M Including SQ. The ground level is a total of 118M2 and the upper level is a total of 87M2. The servant’s quarters has a total of 19M2. Total are is 224M2 for the main house and SQ. Beautiful house plan! Please give me an estimate to contruct this one… on an 1/8th on red soil. Would also appreciate an estimate. Have a 1/4 but want to build on 1/8 of the property. Check you email for all the details. I have addressed all the questions you have asked. You idea on building on 1/8th of the land can definitely work very well. Are you open to making modifications for me? Please send me a quotation and details/link of previous work. My foundation might require raft since its redsoil and the rock is far down. I have inboxed you all the details Samuel. Hi, i would like to know the total cost of building such a house. 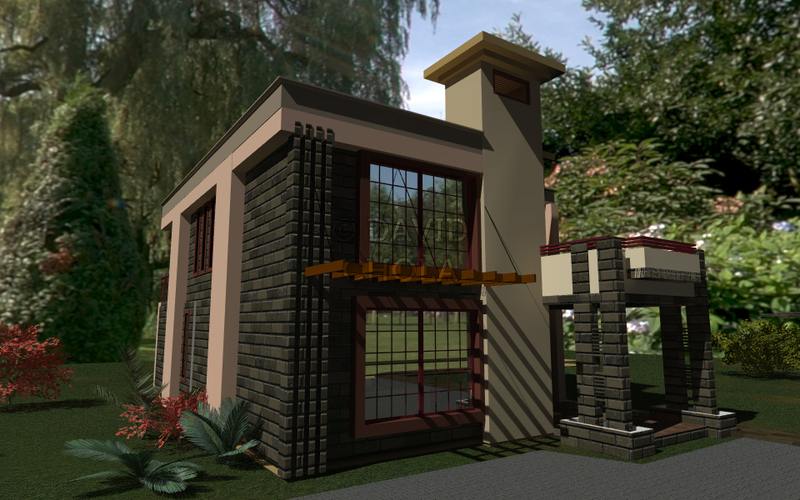 The two designs are very similar, but one structured to fit within a narrow piece of land for clients who have that kind of land. I have sent you more details via email. What would be the cost of constructing such. land size 58X87ft. Also kindly share with me plans for a 4 bed room bungalow with cost comparisons with such as this one. Kindly check your email for all the details requested. Kindly check your inbox for our very detailed email on this particular house plan. Hi I have half an acre land with a width of 35 metres. Can this fit? Can I do it in stages as I am on a tight budget. What would it cost. Land is in diani. I have sent you a detailed email on this house plan. Yes, its is possible to to build it in phases and it can definitely fit in a half acre piece of land. Hello David, give me some more details on the contemporary house. I intent to build at Rongai the soonest. Regards. Hello David, I would very much appreciate an email with more details regarding this house plan–approximate cost, how long to construct, etc. Thank you very much! Check your email for all the details on this plan. We have a 1/8 plot size, please share more details on the design, with some slight modifacations we could make the plan work for us, a meeting? Please get back. Very good design. 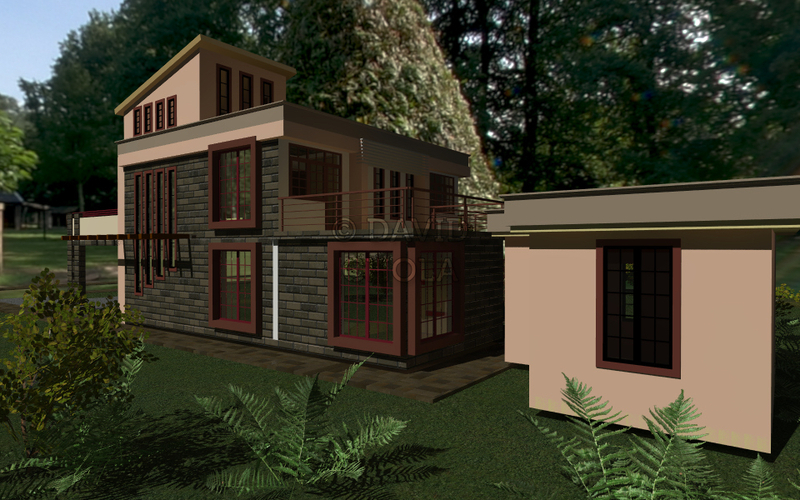 Please give a quote of the contemporary 4 bedroom design shown. I like the above plan am interested to know the total cost in Nairobi area. Kindly check your email for all the details on this plan. I like the plan. How feasible is it on 40 by 80 piece of land? what are the estimate costs for the same built in 2 phases -Ground floor then first floor? I have sent you an email with all the details on this house plan. Respond and lets take the discussion further. 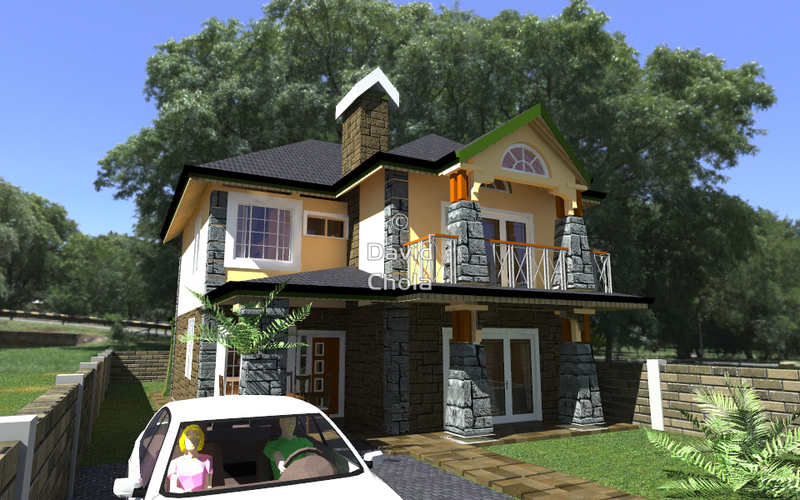 Hi, kindly what is the cost of construction for the house and the roof design. Nice house plan. My farm is at Nyahururu. Quotation please? Kindly check your email for all the details. 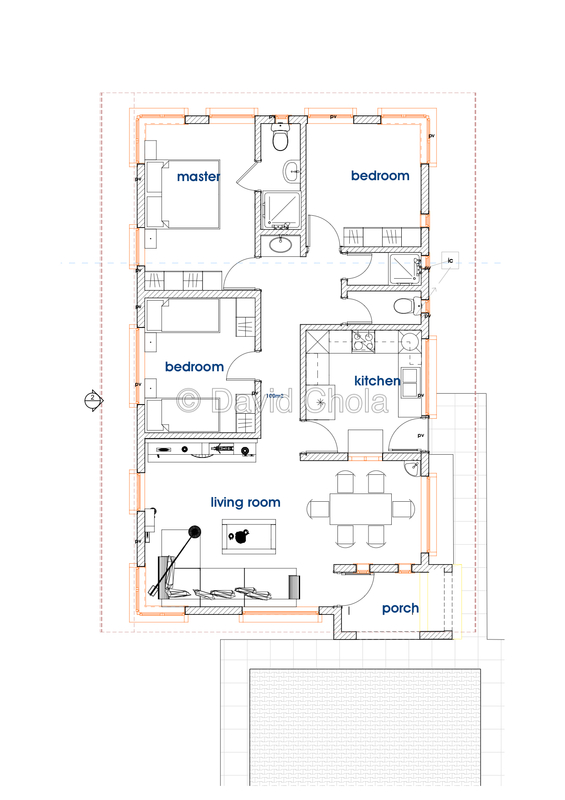 The house plan as been designed to fit in a tight plot like yours very well. 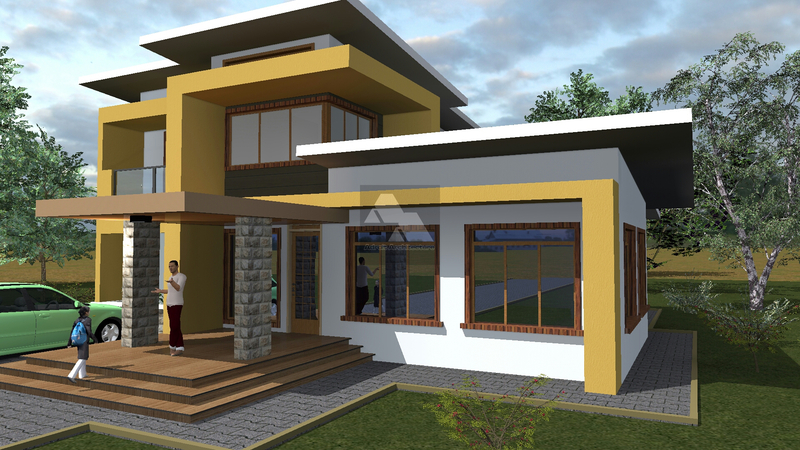 hi, I love the Contemporary Concise 4 Bedroom House Plan. would love to build on a 50/100. how much would it cost, and how much free area would be left for landscaping? 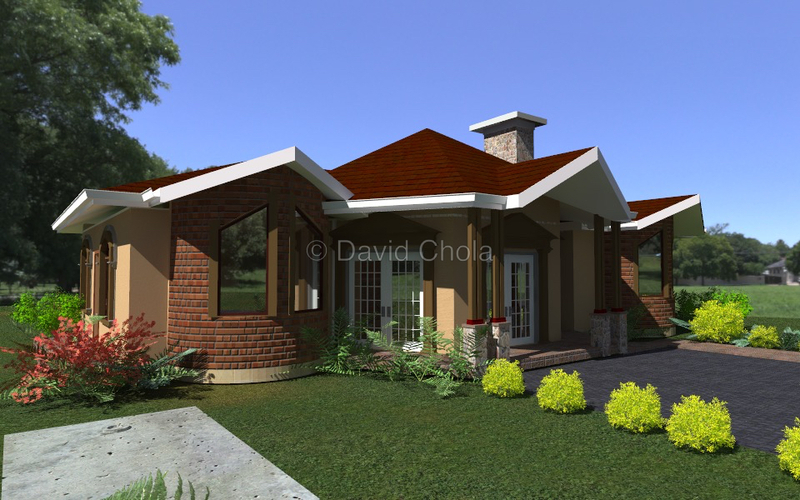 This house plan is well suited for a 50*100 piece of land. The house plan has a plinth area of 10.6M by 75.5M and your land is 15.24M by 30.48M so you can see the amount of space you will have all around. Thanks for your fantastic insights. 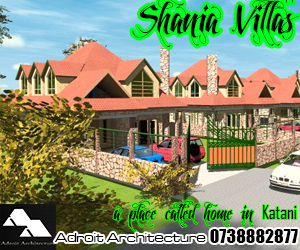 What would be the approximate cost building a four bedroom masionate on a 50*100 plot at Kitengela? 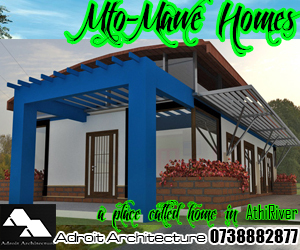 Kindly provide the price estimate for the house. Check your email. I have sent you all the details on this house plan. We specialize in coming up with designs and modifications to fit these designs into the needs and budget of our clients. In your case, we need more information before we can give you the right advice. Please share more. 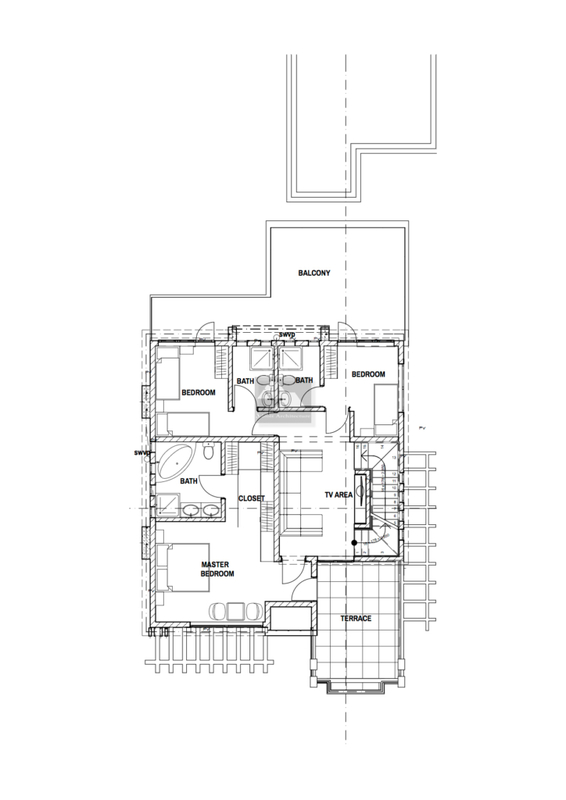 Are you talking about an existing house or is it house plan you have that you would like modified? Kindly get in touch and with more details, we can take this discussion further. This is a great house plan. kindly indicate the estimate cost of building such on a 70*70 plot which already has a foundation in place. I have sent you a detailed email on this house plan. Kindly check it and revert back for further discussions. I have sent you all the details on this house plan. I love the concept of this house plan. Kindly advise on the cost of this house. Also, is it possible to have a personalized version of this plan with just a few a modifications? We’re working with a quarter acre. I hope you got my detailed email on this house plans. Kindly get in touch. Could any suggestions for a corner or one sided 4 bed room massionette? Your concern is that you need a house plan for a corner plot. Let this not worry you. 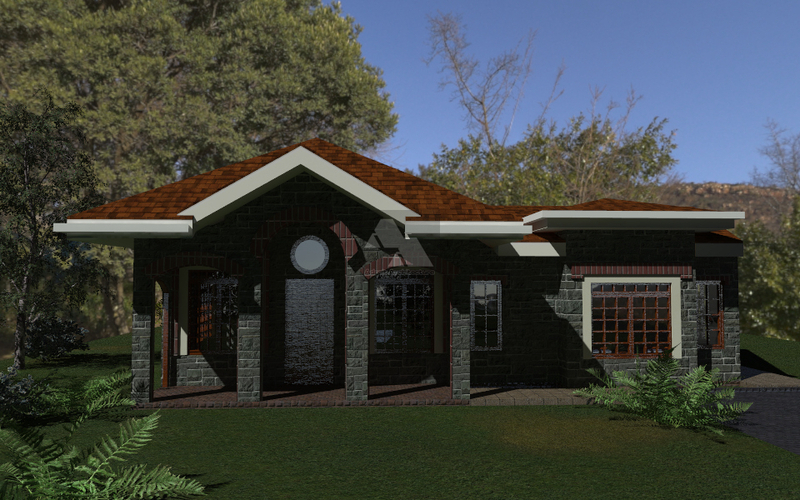 We usually take our house plans and customize them to fit the needs of the client. We will therefore select the best plan that you like in terms of layout and then ensure that it works for your plot. We will see what to do with the drawings in terms of windows and so on. Check your email and get in touch. these are good plans. am sandwiched between three walls. i have the front face only. what kind of plan will provide 3 bedrooms, living room, kitchen, dining, plus auxiliary facilities and adequate light to the house? We need more information on the size of your plan to see how we can position a house to maximize and allow as much natural light as possible. A roof top window can also be a good idea to deal with the issue of light. 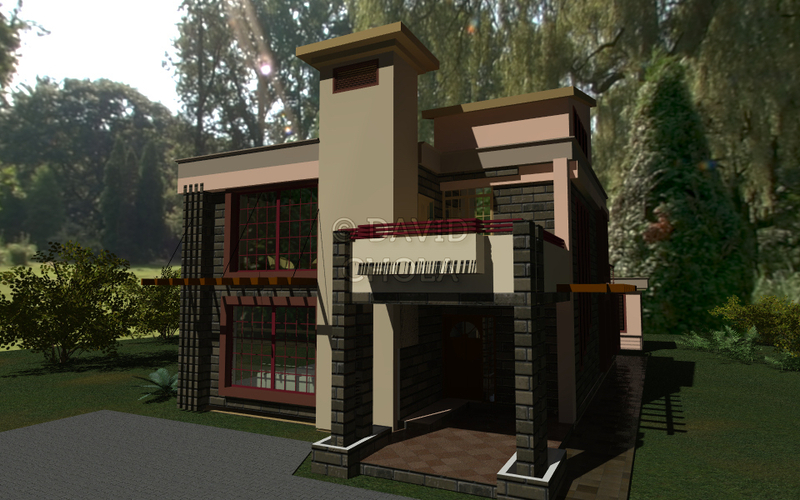 I am considering 3 br Mansonatte in far Nairobi area. I have a budget of 3m. Will this be enough? All 3 bedrooms upstairs and a carpark at the ground floor. Please advice.